Flat feet are the result of arches that have collapsed, causing the entire sole of the foot to touch the floor while you’re standing. It is estimated that around 18 million U.S. adults over the age of 21 have this relatively common foot condition. While there is no treatment available to change the shape of flat feet, there are several non-surgical options for managing fallen arches. One of these options is orthotic shoe inserts. While further research is necessary, researchers believe that wearing insoles can help relieve the pain associated with plantar fasciitis and other conditions that are exacerbated by flat feet. In this buyer’s guide, you’ll learn more about the causes of flat feet and how insoles can help relieve the pain associated with fallen arches. The arches of your feet play an integral role in the way you walk. They help to distribute your weight evenly across your legs and allow your feet to adapt to various surfaces. Those who have little or no arch have a condition called overpronation – also known as flat feet. Overpronation is characterized by the inward rolling of the foot toward the arch. If not corrected, overpronation can lead to more serious injuries such as bunions, heel pain, lower back pain, plantar fasciitis, and shin splints. Many individuals with flat feet have no noticeable symptoms, but others may experience mild to severe foot pain as a result of overpronation. Flat feet typically only need to be treated if they are causing extreme pain or are caused by an underlying health issue. Other common treatment options for overpronation are wearing supportive shoes, performing exercises designed to strengthen the arches, and wearing custom-made or over-the-counter orthotics like insoles. How Can Inserts Help with Flat Feet? Insoles for flat feet are designed to support the arch and stabilize the foot. This prevents overpronation and helps relieve the pain caused by bunions, plantar fasciitis and other conditions associated with flat feet. Insoles also absorb and compress shocks while you’re performing high-impact activities like running and playing sports. While arch supports don’t cure flat feet, numerous studies suggest that wearing arch supports can help alleviate the pain caused by overpronation. 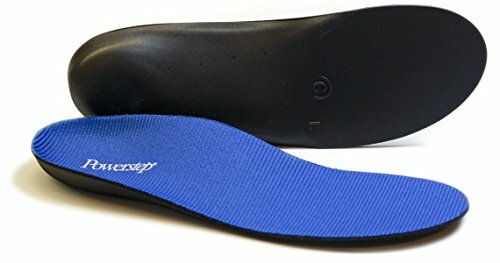 Insoles are a versatile, inexpensive alternative to supportive shoes. They provide varying levels of arch support and can be worn in just about any type of men’s or women’s footwear. It should be kept in mind, however, that over-the-counter orthotic devices are not intended to replace professional treatment. Depending on the severity of your condition, your doctor may recommend custom-made insoles. There are three main types of insoles for flat feet: soft, rigid and semi-rigid. This is the most flexible type of insole. They are typically foam based or contain a cushioning gel that helps absorb shocks. Soft insoles are recommended for those who only require mild to moderate arch support. 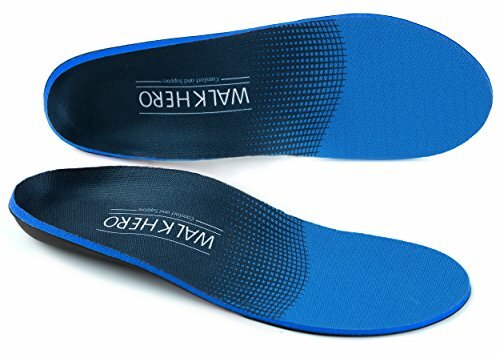 Also called functional orthotics, these insoles offer maximum support and stability. Despite their name, rigid insoles can be made from flexible materials like cotton terry, leather, and memory foam. These insoles are typically custom-made and can be ordered by a podiatrist or an orthopedist. Rigid insoles are recommended for those who require a high degree of arch support. These firm yet flexible insoles are made from foam, leather, plastic, and other supportive materials. They are recommended for people who require moderate arch support. Semi-rigid insoles are usually preferred by those who are new to orthotics, as they are widely available and can be purchased over-the-counter. Insoles for flat feet vary widely in comfort, construction, and the degree of arch support their provide. Here are a few important things to consider when choosing insoles for flat feet. The right type of footbed for you will depend on the degree of arch support you require. Rigid arch supports are ideal for those who need the highest level of arch support. Semi-rigid arch supports provide both flexibility and support for the arch. Cushioned arch supports are recommended for walkers or runners who need extra padding to protect against shocks, while flat cushioned insoles provide no arch support at all. Insoles are available in different lengths, ranging from 3/4-length inserts that are designed to be worn in the toe area of the shoe to full-length insoles that are intended to completely cover the existing insole. If you’re purchasing full-length inserts, keep in mind that you may need to remove the original insoles from your shoes before using your new arch supports. Most full-length insoles are too thick to be worn in addition to your shoe’s existing insoles. Insoles are made from a variety of materials, including foam, leather, and cork. Each material has its benefits and drawbacks, but in general, insoles made from foam offer the best cushioning, support, and pain relief. Cork offers excellent arch support, while leather provides soft, supple comfort. The more pronounced the heel cup, the more effectively the insole will be able to stabilize the foot. for maximum comfort and shock absorption, look for insoles that have a deep heel cup. The right size insole for you is determined by your shoe size. Some insoles are designed to be trimmed before use, while others cannot be trimmed without damaging the supportive structure of the insole. Before buying insoles, check the packaging to ensure they’ll fit properly inside your shoes. Good shock absorption is an important feature of insoles for flat feet. Look for insoles made from multiple layers of foam, are gel filled, or are constructed from supportive memory foam that won’t compress over time. There are hundreds of insoles available, each with their advantages and disadvantages. In this section, we’ll review the top shoe inserts for flat feet that are currently on the market. Powerstep insoles offer superior support for heels and arches. They are designed to fit into most types of footwear, including running shoes, dress shoes, and heels. The inserts feature an antimicrobial, moisture-wicking top fabric that helps keep your feet dry and odours at bay. They also feature a special dual-layer cushioning that absorbs shocks as you walk or run. Available in a wide range of sizes, Powerstep insoles will fit men’s shoe sizes 3 to 14.5 and women’s shoe sizes 5 to 16.5. What makes Powerstep insoles so comfortable is their deep heel cradle and semi-rigid arch support, which add stability and help properly align your feet. This semi-rigid design is made possible by a polypropylene-encased shell that helps the insole retain its shape and structure. That said, these insoles aren’t without their faults. The polypropylene shell, while effective at maintaining the insert’s shape, is less durable than materials used for solid arch support. Because of this, Powerstep insoles tend to wear out faster than other insoles for flat feet. Another minor drawback of Powerstep insoles is that they cannot be trimmed for a more precise fit without altering the shape of the inserts. 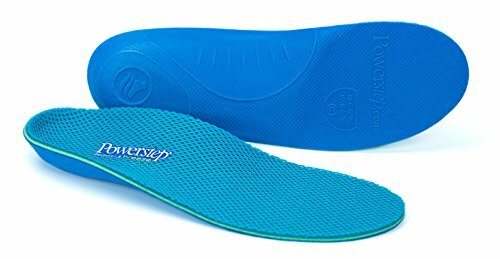 Overall, though, these insoles are an excellent choice for anyone who only requires mild to moderate arch support. Sof Sole’s Athlete Performance insoles are full-length inserts that are designed to fit all arch types. They feature a flat cushioned design and a full-length footbed with additional gel pads in the forefoot and heel. Their slim design makes these inserts suitable for use in athletic shoes, casual shoes, and work boots. The Sof Sole Men’s Athlete Performance Full-length Gel Shoe Insert is available in men’s shoe sizes 7 to 16 and are made of high-quality synthetic materials and feature a fibrous, moisture-absorbing top layer to help keep your feet dry. Since this top layer is not antimicrobial, however, so the insoles need to be cleaned periodically to prevent the growth of odour-causing bacteria. Despite this minor annoyance, Sof Sole Athlete Performance insoles are a great option for managing flat arches. WalkHero insoles are ideal for those with flat feet, arch pain, heel pain, plantar fasciitis, bunions, arthritis, or knee pain. They can be purchased in men’s shoe sizes 4 to 16.5 and women’s shoe sizes 6 to 14.5. WalkHero shoe inserts feature anatomical supports, which correct the alignment of the feet and legs to provide superior comfort and relieve the pain associated with overpronation. These insoles have a wide design, making them perfect for use in a variety of shoe types – including work boots, dress shoes, running shoes, and athletic shoes. They have an antimicrobial top layer that not only keeps your feet cool but also helps reduce friction. Best of all, WalkHero insoles are among the most durable shoe inserts around. According to the manufacturer, they can be used for up to 2 years. WalkHero insoles aren’t machine washable, but they can be easily spot cleaned with mild soap. 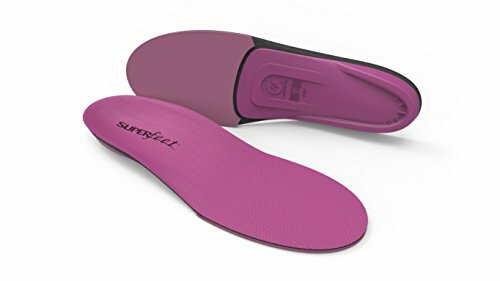 Superfeet BERRY insoles are designed specifically for women. They fit all types of women’s footwear, including athletic shoes, high heels, dress shoes, running shoes, and boots. Superfeet BERRY insoles are made from highly responsive foam and feature extra cushioning in the forefoot to deliver exceptional shock absorption, whether you’re walking, running, or playing sports. A deep, narrow heel cup helps stabilize the foot during high-impact activities and ease pressure on the feet, ankles, and knees. Superfeet Berry shoe inserts are available in women’s shoe sizes 4.5 to 12. Unlike some other types of inserts, Superfeet BERRY inserts are removable, this means you’ll only need one pair of insoles for all of the different shoes you wear. Of course, this versatility comes at a cost, which is reflected in their high price. 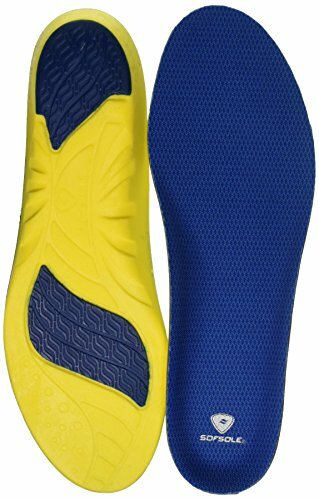 Another drawback of the Superfeet BERRY insole is that it is only designed to fit medium arches. Overall, though, these shoe inserts provide great all-day support for flat feet. Powerstep Pinnacle insoles combine plush cushioning with stabilizing features to provide enhanced comfort and ease the pain associated with plantar fasciitis, pronation, and other common foot conditions. They feature a double layer of shock-absorbing foam and a deep heel cradle that help align the feet and legs. Powerstep insoles use Variable Cushioning Technology, a soft and supportive foam that conforms to the contours of the foot. A durable EVA base adds to the long life of the inserts, while a moisture-wicking and antimicrobial top layer helps repel odour-causing bacteria. Power Pinnacle insoles are available in men’s shoe sizes 3 to 14.5 and women’s shoe sizes 5 to 15. The inserts fit well in most types of women’s and men’s shoes. They provide excellent cushioning from shocks, and the semi-rigid contoured arch support is both flexible and firm. That said, some reviewers have reported that these insoles take a while to get used to and may cause discomfort at first. Another minor drawback is that these insoles are not well suited to those with deep arches. Despite these minor complaints, the Powerstep Pinnacle is a good choice for those with mild to moderate foot pain. hese insoles have it all: excellent shock absorption, stabilizing features, exceptional cushioning, and a breathable antimicrobial top layer. Add in its affordable price and the fact that these inserts can be used by men and women alike, and the Powerstep Pinnacle comes out the clear winner. Are Arch Supports What You Really Need? Over-the-counter orthotic devices are a great alternative to surgery for those who require mild to moderate arch support. Not only do they help to align the feet and legs, but they also provide cushioning to soothe aching feet and relieve heel pain. This buyer’s guide should help you understand all of the different shoe insert options that are available so you can choose the right insoles for your needs. However, as already mentioned insoles do not cure flat feet. Before trying insoles you may want to consider trying to fix your flat feet through specific exercises that target the strengthening of your inner arch. Exercising doesn’t always work for everyone but you may want to take a look and try exercising your arch for a couple of weeks prior to buying an insole. You may find that you do not even require insoles! For more information see our page on how to fix flat feet.